Bob and Martha Seamans lived in Georgetown, D.C and started collecting antique prints, maps and volumes of work around 1950. Martha was an early IBM computer programmer and Bob was a college recruiter. As Bob traveled the country recruiting he was able to visit hundreds of book shops. Annual road trips up to Maine also provided an opportunity to visit all the book and print shops from the Mid Atlantic to northern New England. Over years of travel and their growing appetite, they cultivated a beautiful collection, vast in subject matter. 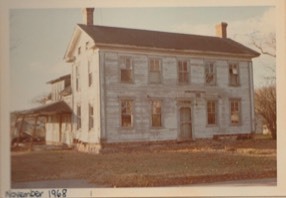 In 1965, Ocean View's oldest home was purchased by Bob and Martha Seamans, saving a local landmark and a fine example of 19th Century architecture from the brink of demolition. Still living in Georgetown, D.C., they would go the Bethany Beach and work on their “new” house on the weekends or as often as they could get there. Eight years of restoration later and the circa-1850 home was brought back to life and ultimately, provided a home for Antique Prints, Inc., Bob and Martha’s ‘hobby-turned-obsession’ of collecting antique prints, autographs and maps. The Antique Prints shop opened officially in 1970. By appointment only, the Seamans’ began by showing their prints in their living room. A new addition was built in 1980 providing much more room to store and display their growing collection. 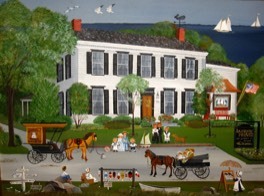 Custom framing became offered in 1980 and has turned into a landmark for quality art services of all kinds. In 2005, the Seamans’ daughter and son-in-law, began running the business full time. Kerry and Brandon Case continue the tradition of providing an expansive selection of material from the 17th-19th Centuries. Fine prints of early America, city views, maps, botanicals, birds, animals, shells, anatomy, civil war, american history, Winslow Homer, decorative, and many other subjects, all dating generally before 1880. Full custom framing is available and done on-site for more than 500 clients each year. Antique Prints is located at 42 Central Avenue in Ocean View, DE 19970.